Gee, Wizz? | Words, By George! I recently travelled from London-Luton airport in the UK to Skopje in Macedonia. Skopje is a destination that few airlines service directly from the UK. The one exception to this is Wizz airlines, a Hungarian budget airline that offers the EGGW-LWSK route 5 times a week. So I booked an outgoing flight for early September, with a return flight in mid-October. Easy, yes? No! Tickets can only be purchased on-line. There is no option to email the company should you have a problem with the booking. So of course I had a problem. The web based system would not accept my credit card details. The only option I had was to do an international electronic funds transfer, which I duly arranged. A week later my travel details had NOT be confirmed. I found that I could contact the company’s call centre in London at the princely sum of GBP1 per minute. I was told the original booking had been cancelled, and thatI would have to rebook. Yes, the IEFT would be applied to second booking, by linking the original booking number with the secondary booking number. After rebooking I needed to contact the call centre agaian to again recheck why the booking was still not confirmed. I managed to confirm the booking with this call, and received electronic verification; but I was asked to pay another GBP20. OK, I thought, I can put up with that. Then there was the on-line check-in that must be completed prior to arrival at the airport, or pay an additional fee at the airport. But hang on a minute, my wife who is a non-EU passport holder would need to check in at the airport to have her passport checked! Let me think about this a minute! We have to check-in pre-paid baggage at the check-in desk. So we need to check in on-line to avoid a fee, but still need to check-in at the desk for a non-EU traveller and check in baggage. Go figure! Oh, did I mention that there is a fee for carrying a “large” cabin bag. I always thought a cabin bag was made to set dimensions, not so it seems to Wizz. Then there was the flight! Flight Number W67702 (A320 HA-LYD c/n 6115) on 2014-09-10 left Luton-London at 08:34, 19 minutes behind schedule. An hour into the flight the PIC (Pilot-In-Command) is seen for an extended period fraternising with cabin crew in the passenger cabin of the aircraft whilst drinking coffee. Who is flying the aircraft? The door to the flight deck is also left open for a considerable amount of time. An hour out of Skopje, two members of the cabin crew dissappear onto the flight deck, with the female member of the crew remaining there for 20 minutes or more! Why so? In my opinion, the behaviour of the flight and cabin crews demonstrated a distinct lack of protocol, safety and security in the way this flight was conducted. I left with no option than to believe that the airline condones this sort of in-flight behaviour of it’s flight/cabin crews! I suppose the final insult was that the touch down in Skopje was so poor, with the aircraft bouncing so heavily, I was forced to consider whether we had landed or indeed had we been shot down! All in all, in my opinion, Wizz delivered a very dismal performance in terms of in-flight safety and security with basic in-flight protocols being ignored. There was open access to the flight deck for a considerable time. Wizz clearly offer flights made down to a price, NOT up to a standard. 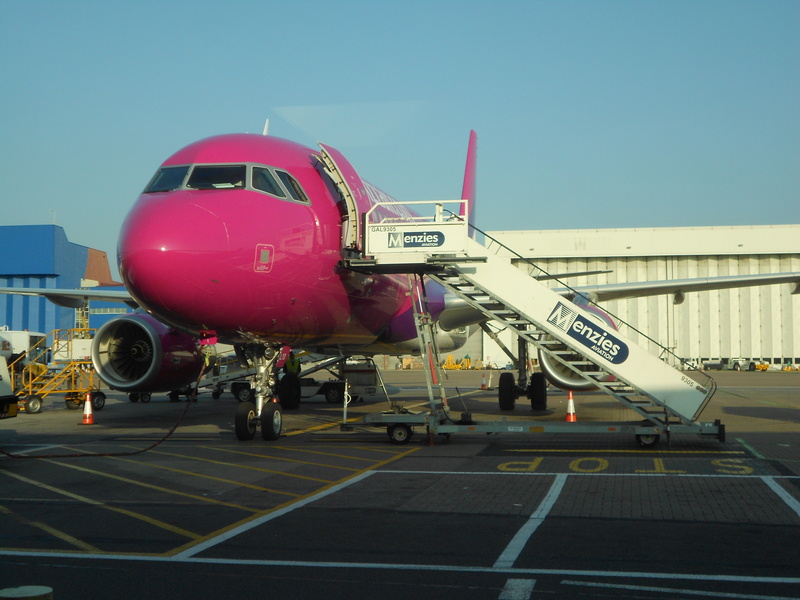 For further reviews on Wizz Air’s performance as a budget airline, go to http://www.airlinequality.com/Forum/wizz.htm. That’s called plane sailing George!! That’s one way of looking at it! LOL! Pingback: The Worst Airport in the UK | Words, By George!